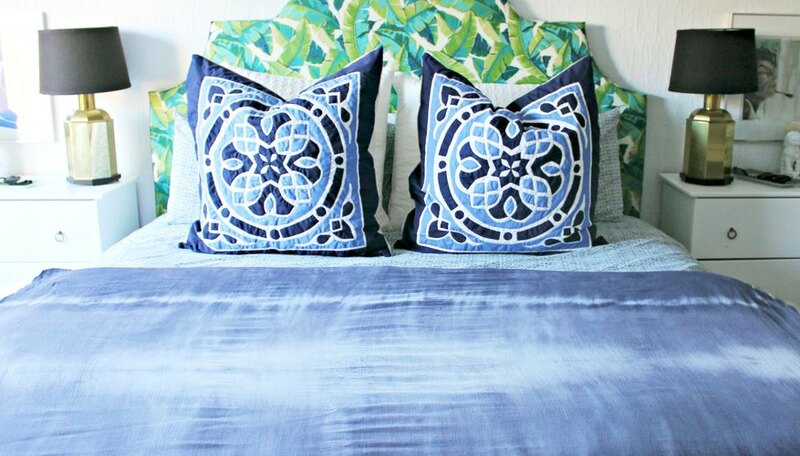 Indigo dyed textiles are very hot in the design world right now. 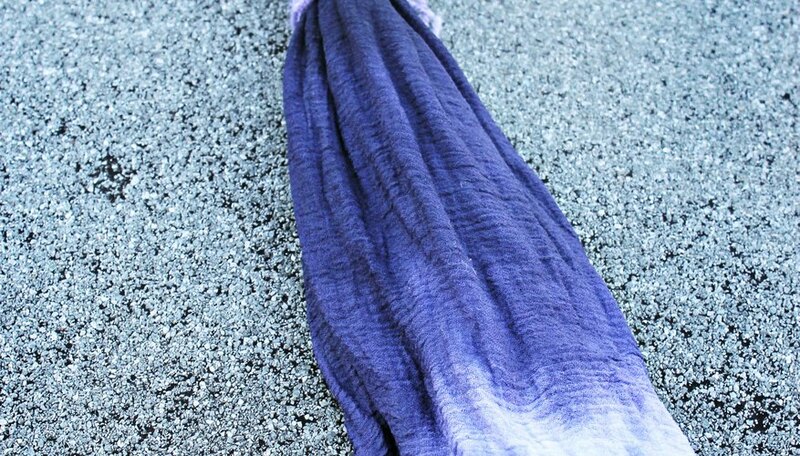 The most popular style was inspired by Shibori dye, which is a Japanese tie-dye technique that uses natural indigo dye and different wrapping techniques to achieve a desired result. I wanted to find a shortcut technique using pre-made liquid dye and water. 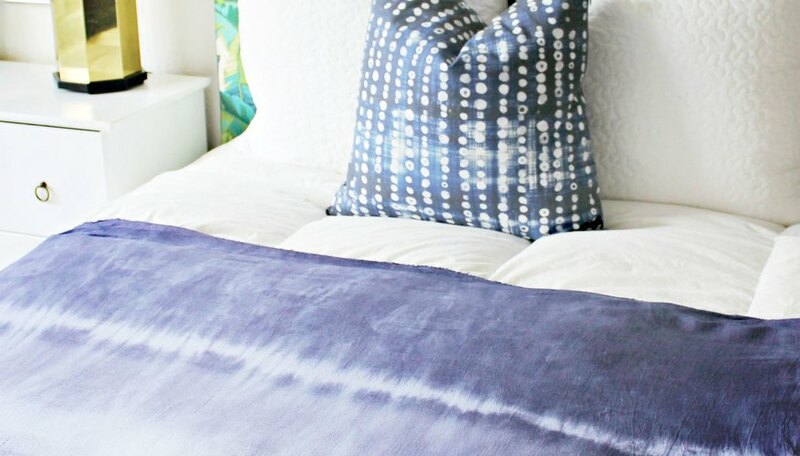 Here's the DIY to achieve the Shibori look faster and cheaper. 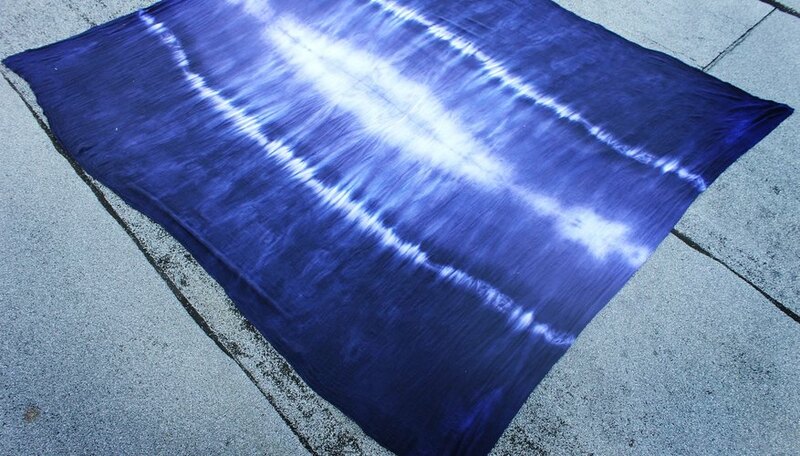 I chose to use Rit Dye in navy, but indigo should give you a similar color if you choose to stick to the Shibori look. Fold your fabric lengthwise until you have a piece that is about a foot and a half wide. I used two yards of a gauzy linen fabric with a little bit of texture so the dye would look more natural. Bunch up the fabric, making sure not to roll or fold -- you want the creases to look organic and not uniform. Tie around the middle with string, winding it around itself until you have about an inch of string wrapped around the fabric. The tighter you tie your string, the less dye gets through. The parts that you tie with string will remain white, so tie the string as thick or in as many places as you like to achieve a different effect. Soak your fabric in the sink and wring dry. You want the fabric to be damp so that the dye will bleed a little bit. When the fabric is wet, the line will be less harsh when you dip it into the dye. You will need to use gloves for the remainder of this project! 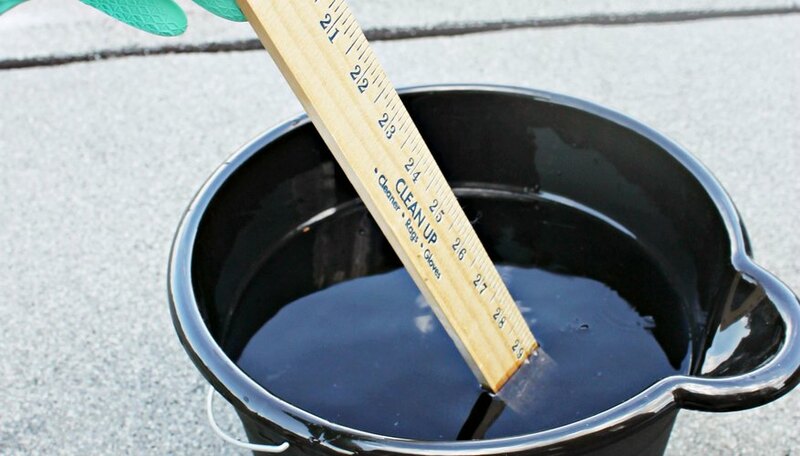 Fill a bucket with hot water (140 degrees Fahrenheit) and prepare the dye. 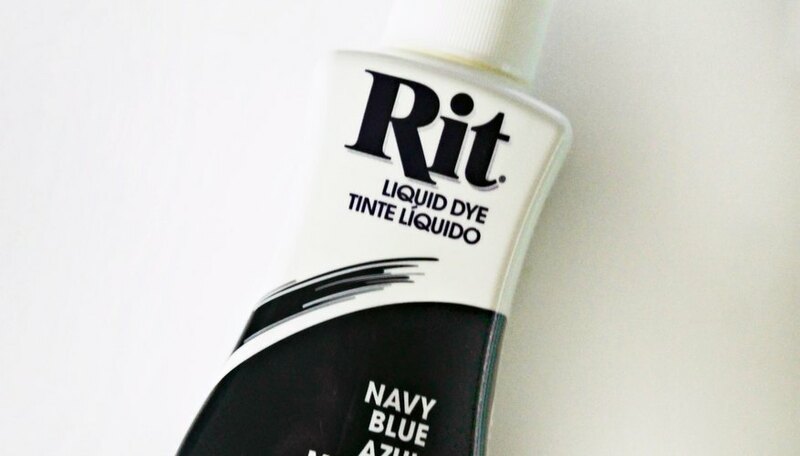 Follow the directions on the dye bottle depending on how much fabric you are using. 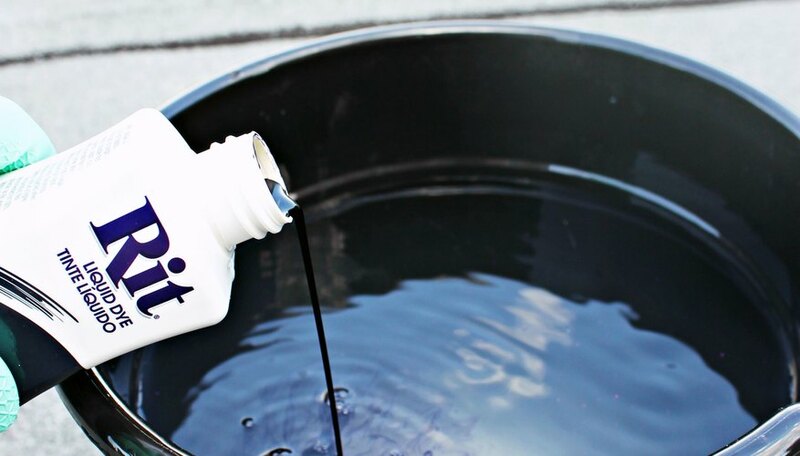 The recommended amount of dye per gallon of water is half a bottle per one pound of dry fabric. It also says to double the amount if you want a more saturated effect, which is what I did. I ended up using one bottle for this project. 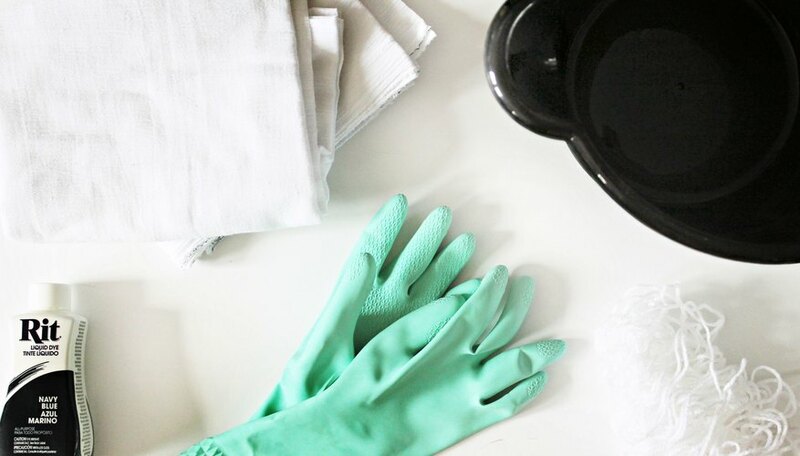 If you are using linen, gauze or a light fabric, dissolve one cup of salt into your hot water before adding the dye. Once the dye (and salt) have been added, stir the mixture. For this project, I wanted to leave a little bit of the exposed fabric white, so I slowly lowered the fabric 3/4 of the way into the bucket and draped the remainder over the side of the bucket. For more saturated dye projects, dip your entire fabric in the dye. 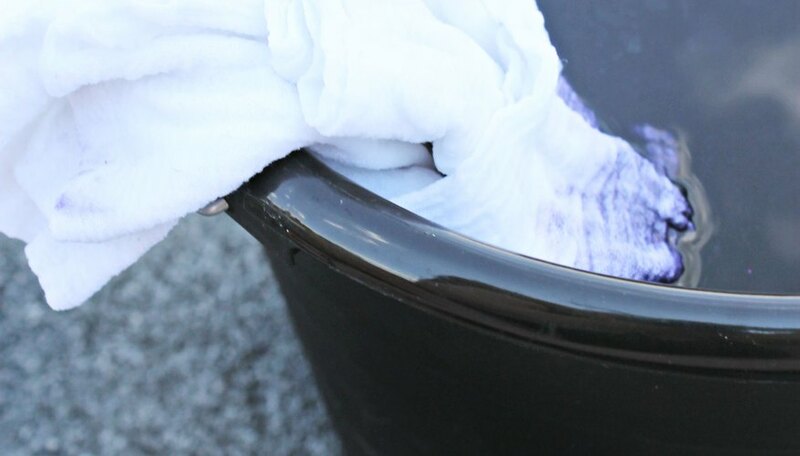 Let fabric soak for 10-30 minutes, checking on the color. I soaked my fabric for 20 minutes without touching it once I saw that it had darkened to my desired color. Remember, the fabric will always be lighter when it's dry! Push the fabric further down in the dye and soak for another 5 minutes. Doing this will give you a layered ombre effect. I chose to leave the ends white by keeping them out of the dye. 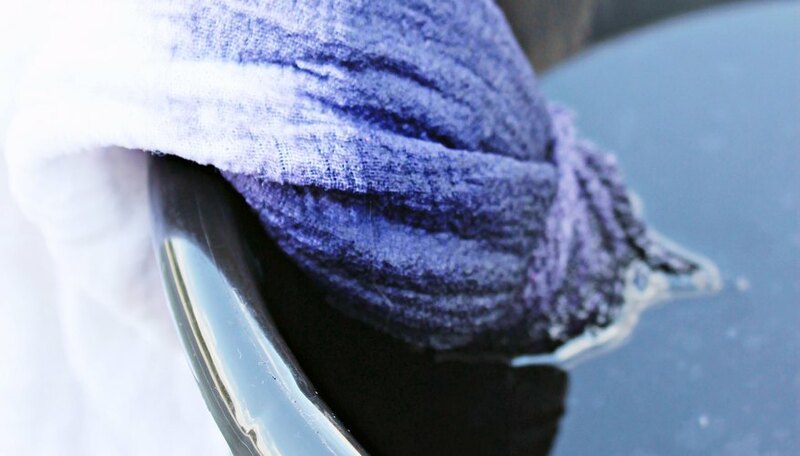 Remove fabric and wring the excess dye back into the bucket. Make sure you're still wearing your gloves! 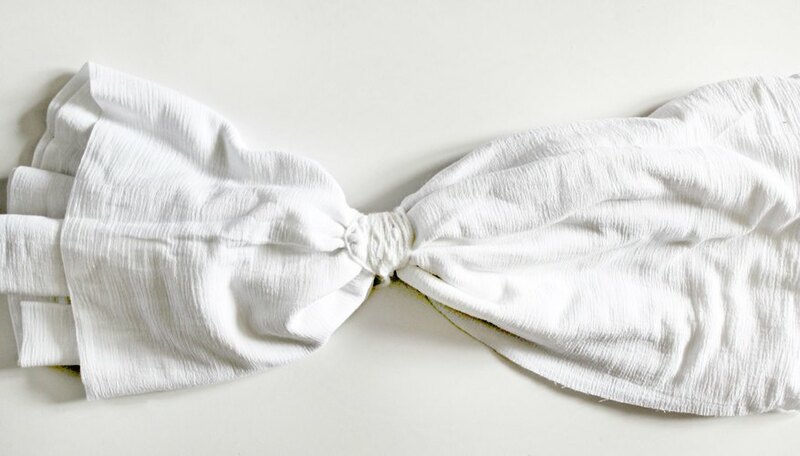 Carefully untie the string and lay flat to dry, and let the fabric dry completely. Keep out of the sun for a more saturated color effect, or place in the sun for a slightly faded effect. Once dry, follow the instructions on your bottle for rinsing the fabric. There are several different options for rinsing your dyed fabric, depending on what you have access to. Make sure you keep your gloves on for the rinse! I chose to rinse the fabric with cold water with my shower head in the tub, which was quick and efficient. Lay the fabric flat in the tub and rinse with cold water, wringing out the excess water every few minutes. There will be a lot of color bleeding out with the water, but no worries, this is supposed to happen. Lay flat to dry again. This time, I placed my fabric in the sun because I wanted it to look a bit faded. Since it was fairly thin fabric, it dried in just a few hours. Bring fabric inside and style however you like! 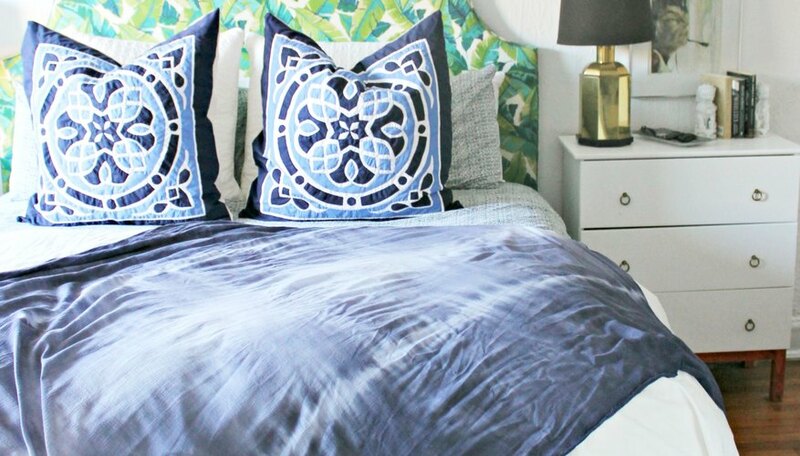 I chose to lay the textile across my bed for a pop of color against my white bedding. This is a great option because it can be changed out seasonally! Depending on the size of your fabric, this textile can be used for many different things -- picnic blankets, scarves, tablecloths, or decorative throw blankets. Have fun dyeing to your heart's content! Just remember, always wear gloves! Have a boring headboard or couch? Drape this textile over your headboard or over the back of your couch for an unexpected pop of color! Shannon Smith is a DC-based marketing coordinator by day, and interior decorator and blogger by night. Her blog, Burlap and Lace, has been featured by brands such as Home Depot and Better Homes & Gardens, and her design business, Shannon Claire Interiors has been published in the Washington Post.